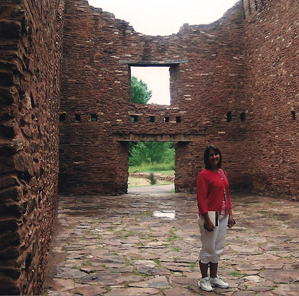 and already I’m making summertime plans to revisit the Salinas Pueblo Missions National Monument. This trio of abandoned pueblos/missions in central New Mexico is—according to modern modes of transportation—off the beaten path. But in its heyday, everyone got around on foot. Although the area was temporarily resettled in the 1800s, the majority of occupants left the area prior to the Pueblo Revolt of 1680. If you knew supplies would be replenished only once every three years, what would you ask for? Personally, I would want soft cotton socks and comfortable shoes. And while there are plenty of modern conveniences I am now used to (hello Internet),what would I need in the 17th Century that could not be found in nature? Want a fluffy pillow? Find some feathers. A good book? Even if I could read back then, I wonder if there would have been time for leisurely activities. After all, to get that fluffy pillow would require collecting feathers, cleaning them, weaving fabric, sewing a pillow case (making a bone needle, collecting and carding some sort of material for thread), and if the feathers came from domestic birds, add feeding, watering, and doctoring to the list. I know I am forgetting something, and that’s just for a pillow! When I visit mission ruins, I try to imagine life as it was for the American Indians whose ancient culture was being remodeled after a European way of life. Before contact, any supplies they required would have been homegrown, hunted, or traded, and it wasn’t until they became accustomed to foreign conveniences that these things were desired. I also try to imagine life for the Franciscans (or in other places and times, Jesuits) who managed the missions. While their physical needs were met with and by the people with whom they lived (local food, regional building supplies, some fabrics, pottery for cooking) their purpose for coming to the New World required religious tools which could only be collected from craftsman far away, such as books, clerical vestments, and objects for the celebration of mass. My guess is a few of these men were probably homesick too. Hardships accumulated for both the natives and the clergy—European immigrants including successive generations—but as to whether one group suffered more than the other, well … history attests to factions, slavery, and the dismantling of ancient cultures. Although not all things are equal, the introduction of advanced technologies, new animals, and different foods did broaden the scope of knowledge and convenience for the aboriginal whose world was beforehand confined to one continent. I have traveled thousands of miles overseas and love learning about new cultures, eating different foods, and thinking about two things: What do I give, and what do I take away? Visiting mission ruins draws me to a different kind of introspection. What can I learn from the past? I encourage you to visit the Old Spanish Missions, and if you do, you may find yourself asking the same questions. I’d love to hear your answers. Want to share this blog? Click HERE, click tweet, done. There are wild turkeys in my backyard. They come down from their mountain roost and often appear in autumn. Guess no one told them about their being the traditional holiday menu centerpiece. I have counted as many as seventeen at one time gobble-gobbling, scratching the ground, and leaving their fertilizer where nobody wants it. But when the boys strut their stuff, their bright red wattles and blue faces are something to behold. And don’t let anybody tell you they can’t fly. Once, when I didn’t know they were pecking very close to my back door, I let my dog out and they flew to the highest branches they could get to in the Ponderosa Pines. Turkeys are native to North America, so before this continent was explored by Europeans, no one in Madrid ever experience the glories of giblet gravy. So when did the galliformes finally arrive overseas? Although turkeys do fly, to cross the Atlantic they needed a bit of help. Enter European explorers. Someone, possibly Christopher Columbus, brought several turkeys back home to show Ferdinand and Isabella. (It is more likely, however, that another explorer, maybe even a Franciscan friar interested in this wonder of God’s creation carried the first bird on board.) At first, the turkey was more prized for its feathers, but someone must have used their crystal ball to see far into the future and know how important succulent smoked turkey legs would be to modern day Renaissance Festivals world wide. 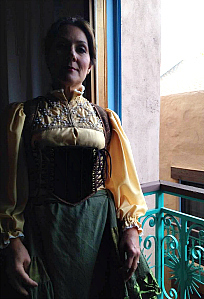 Or should I say Renaissance Fare? Turkey feathers are beautiful. And they’re useful. Turkey feather blankets and robes were used at Pecos Pueblo (near Santa Fe, NM). Long, slender, and hollow, turkey bones were made into a type of flute. It is important to note that the turkeys’ domestication in the American continent came as early as 800 BC, and later its significance was increased as a religious ritual and ceremonial icon. Prehistoric people from the Mogollon (muggy-own) culture, AD 150 to about AD 1450, painted turkeys on Mimbres pottery (the collection of Mimbres pottery at Western NM University in Silver City is worth the visit—it is expansive! Plus, Silver City is renown for fine dining, AND for you hiking aficionados, there isn’t enough time in the day). As you know, I love to cook Southwestern food, so when I wanted to learn how to roast a Spanish style turkey, I searched everywhere until I found a recipe and a chef who made me feel right at home (and I kinda wished I was at her home tasting the cilantro and garlic marinated bird). And after the feast to work off extra calories, let’s dance! Think of it as just another way to move the bird along. While visiting any Mission ruin, I have to inspect the walls. The bricks, commonly known as adobe, are made from mud and fibrous organic matter that, if left unprotected, tend to melt back into the earth. 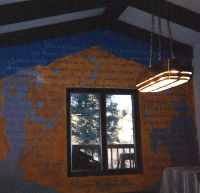 Any surface ornamentation of plaster and paint on the walls is usually the first to go. But where faded decorations of scrolls or angels remain, it’s probably just luck that the ceiling timbers were not stolen and used for firewood; the roof has kept the elements at bay. I have wondered by so many cathedrals and temples around the world continue to survive even after thousands of years, while countless North America Spanish Missions have disappeared after only five hundred or so years, sometimes less. Wars certainly had something to do with their demise, including the Mexican War for Independence from Spain. After the war was won in 1821, the Missions became Mexican government property and were used however they deemed necessary. Some, for example, were turned into schools, jails, and courthouses, while others were sold simply for the land on which they sat. Think of the history lost! In a house, walls hold more than a ceiling; they absorb voices, form perimeters for living areas, and, some people say, they know secrets. Not to be spooky, but I’ve lived in houses with walls that hold secrets. Well … the paint underneath the paint. Pictured below is one of my own wall transformations (that for all I know has been covered up by new owners). To begin, when we moved into that house, every wall was white. 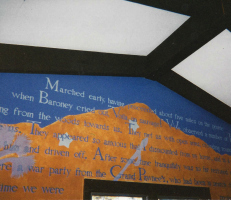 I thought it would be cool to paint a feature wall in the dining room, so the first picture is the (first) result: a quote from Zebulon Montgomery Pike (an explorer for whom the Pike’s Peak region in Colorado is named) was stenciled over a mountain scene. After about six months, my feature wall grew weary–hard on the eyes. So I decided to paint over my masterpiece with a creamy beige. Not being one who knows when to quit, I dipped a feather into a tan color and the result, I thought, was a stroke of genius. I rocked my wrist to achieve an aged look (on the wall–silly–not me). For many years, few people knew the secret of Mr. Pike underneath the art–until now. Likewise, I encourage you to paint a wall and someday make a secret of your own. Send me a pic of the result! At the very least, don’t take your walls for granted. 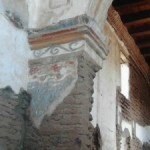 What secret might you find at the crumbling walls of an old Spanish Mission? I bought a one-way ticket because I did not know how long I would be needed. A couple of weeks? Three? Could I leave and come back? My siblings who live closer and who had been caring for him needed a break to take care of their own families and business. And I wanted to be there. As I remember it (surreal as the event, I may have some details out of order), it was about 8am on that Monday morning when I tried to give him his medicine (he was at home in a bed near the picture window so he could watch the birds, racoons, skunks, deer … his cat named Cat), but he could not swallow. Yet the day I arrived, he was swallowing and drinking his beverages through a straw. On Sunday, he was swallowing but having difficulty using a straw, so a syringe was used to give him water, which he asked for often. That day, the hospice nurse came to show me how to care for him by turning and bathing and bending his legs. Her support and care was amazing. In the short time she was with me, we both cried. Eight o’clock Monday morning, I tried to give him his medicine, but an entire pill was simply too large. The nurse had shown me how to pulverize and mix the medicine with a bit of water and place it in a syringe. I know how awful a pill can taste, so I added some watermelon flavored syrup and gave him a little bit. I decided that I would keep giving him those tiny amounts even if the procedure meant I never left his side. My mom was sitting next to him, telling him very sweet things. “You’re my hero,” is one I remember her saying several times. She was holding his hand. I had put powder on my own hands then, so they would easily slide under his back when I gave him a back rub. I also rubbed the back of his head which he seemed to appreciate. Through all this, Mom never moved from his side. Then I got my camera and said, “Mom, you look so sweet there with Dad. Can I take your picture?” She smiled for the camera. Dad kept his face turned toward hers. I gave my dad another dose of medicine—a dribble really. By then, several of my siblings were there, and one of my sisters was on the phone to contact the rest. I put more powder on my hands, and while getting ready to rub Dad’s back again, he simply stopped breathing. It doesn’t make sense, but when that moment comes, you’re never ready even if you’re prepared. I took him by the shoulders and told him to breath! And he did! Once more. That is all. The family stayed by his side until he was taken away. I remember that time very clearly. It was a beautiful autumn afternoon, windy, leaves blowing. We followed the cart that led Dad outside and everyone of his children that was there stood in their own space, mourning in their own way. One of my brothers placed a bundle of canna lily he had cut from Dad’s garden on Dad’s body before the door was closed. 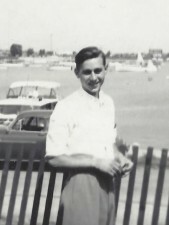 As difficult as all this was, my dad loved life. He loved his wife for 63+ years. 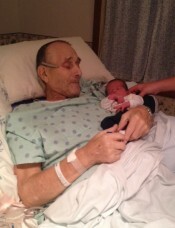 He loved his children, his twenty-one grandchildren, his twenty-two + great grandchildren …. He would say, choose life. And he did. Until his final breath. 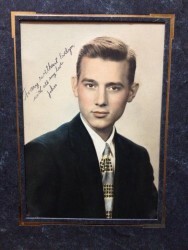 My dad died on October 27th, Andy’s birthday. My guess is that there was a cake. And other family—Dad’s brothers, his sister—friends … and yes. Andy was at the table. In the shadow of Table Mountain to the east and the Rockie’s foothills to the west, the 2014 Women Writing the West conference took place in Golden, Colorado. The autumn sunshine brightened gold leafed cottonwoods that nibbled the edge of Clear Creek, and as much as I wanted to go outside and play, I had been looking forward for months to this meeting of like-minded artists. A writing conference is usually packed with instruction, and although I wanted to attend every session, you have to choose. **sigh! ** Sometimes in my class I’d hear laughter from the room next door and want to rush right over. But then something great would happen in my class and I’d start wishing the women in the other class were with me soaking up the inspiration. In other words, it was all good! One evening, we had an opportunity to preview the film The Cherokee Word for Water where I also learned the word “gadugi” means working together to solve a problem. The film comes out in November, and I will devote an entire post about it but wanted to give you an opportunity to hear about this incredible film as soon as possible. Another event included a silent auction. The grand prize was a beautiful handmade quilt that took a full nine months to create. When the winner was announced, everyone cried because the winner gave the quilt back to the seamstress who made it! 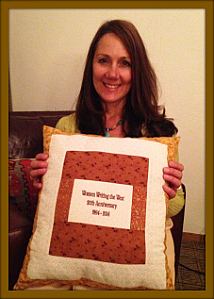 Such generosity lifted my spirits, but when I won a pillow, I kept it! Isn’t it pretty? The Women Writing the West conference included an author book signing. So much fun getting to know my peers! Here are links to a few of my new friends’ websites that include information about what they write. I especially want to mention the noteworthy Florence B. Weinberg PhD. Her books’ topics are closely related to mine (scroll through her site for tons of great information on the Missions). Next, you will deeply connect with Mara Purl’s characters in her enchanting Milford-Haven series. 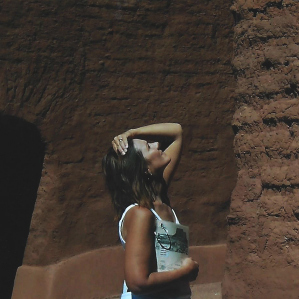 The goal of Mara’s books is to answer who, what, when, where, and why as pertains to the people she writes about in the California Central Coast. It’s a place you’ll want to visit again and again via, naturally, her stories! Check out her website to stay up-to-date on the progress of her books. That should be enough to get you started . . . Finally, many of the authors attended a high tea. The assortment of treats included a pumpkin nutmeg soup, perfect for the season, with tiny bits of onion and a swirl of cream. Delightful! A one woman show highlighted the lives of five notorious western women. I felt inspired by the women who, despite not having our modern freedoms, overcame hardship to prevail. Did I mention that all the participants were invited to dress up? See if you can guess which era each woman belongs to. I look forward to next year’s conference. 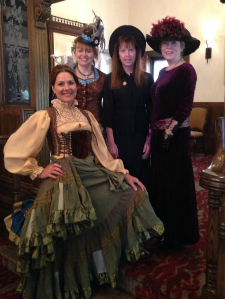 If you are a woman who writes about the west, all genres, fiction or non, consider coming to the 2015 conference. You won’t be disappointed! During a recent visit to the Toledo Museum of Art (Toledo, Ohio—not Spain), I spent most of my time in the wing that houses Renaissance art, and, surprisingly, I did not find a portrait of any woman not wearing some sort of headpiece. So I wondered, when did the custom of wearing head coverings begin? And how many forms or styles are there? Scarves, Hoods, Mantillas, Snoods, Hats, Shawls, Veils, Hats, Headbands . . . The custom of European women wearing head coverings when out in public may have started in the 8th Century when the Moors conquered Iberia. And since Arab women wore headscarves, the custom prevailed. That’s one theory anyway. But what about before then? Like, two-thousand years before then? Or three-thousand, or four? Did the Queen of Sheba wear a head scarf? No doubt Mesopotamian clothing was utilitarian, yet I believe there’s something spiritual about having a covering too. The Bible, in Genesis 3:21, says that after the Fall, Eve was covered by God . . . hey, I think I’m on to something! 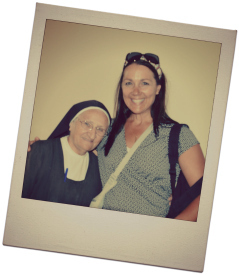 Sister Mary Rose and Me in the Church of the Beatitudes near the Sea of Galilee. But first, a quick story, something I learned from my Israel tour guide, Arie Bar-David. Two-thousand years ago, fisherman worked long hours, and, like any laborer, they needed rest. All of them had pillows. These pillows were not stuffed with fluff like many today, but their pillows were filled with an extra set of clothing. Mark 5:1-20 tells the story of Jesus and a demoniac—a man possessed with a legion of demons. Jesus told those demons to leave the man, and they did. Verse 15 explains how the former demoniac was then dressed and in his right mind. Arie Bar-David asked our group, “Where did he get the clothes?” The answer became obvious: Jesus gave him his spare set. Symbolically, the man was covered by God. Here’s what I know: Head coverings are ancient apparel. The Torah (Old Testament), Numbers 5:18, speaks of it, and in the Bible New Testament, 1 Corinthians 11:1-16 mentions this custom. Some argue that it was only a custom of the day, and customs change. There was a time when all Roman Catholic nuns wore veils, and all Catholic women wore a head covering in church, but this practice is now a choice for most religious communities and women. Even so, it wasn’t that long ago that women and men wore hats to all kinds of functions. Even shopping was a time to dress up. Times have changed! Before I conclude this short blogpost, let me say that this one topic, head coverings, is vast. One could research fabric (wool, linen), time period (when were lace mantillas introduced? ), color (symbolism), type (as listed above), region, and religious views just to name a few. Since it’s such a heady topic, if there’s something specific you’d like me to research, shoot me an email at amy@amynowak.com and I’ll try to answer in a future post. How to knit a snood! Cecil B. DeMille’s epic movie, The Sign of the Cross, takes place during the time of Emperor Nero. In one famous scene, Claudette Colbert bathes in milk, and although the director claimed it was actual milk from a jennet (female mule), the truth is more homogenized; she bathed in powdered milk. The plot emphasizes the heartache of the world’s first Christians. While it is true that Ms. Colbert, whose bath turned sour, suffered for her role, the thing to remember is that torment often follows those who are peculiar. During the first century, persecuted Christians were wary of people they did not know. To protect themselves, they devised signs to confirm identities. The fish symbol inscribed in the walls of Roman ruins may have protected these believers from Nero’s wrath. Possibly, with discretion in mind, one person might hold their open hand, palm up, under their breast, while the other would respond with their open hand under their own breast, palm down. If placed together, the symbol would form a fish. Similarly, one person could, while pressing both thumbs together and crossing their index fingers, form a fish. Alternatively, it might be accomplished with one hand by simply crossing the forefinger over the thumb. Theories abound. But one thing is for sure, many people today still make the Sign of the Cross. In the air: This form is used by a priest to bless someone or something, and it is accomplished by holding the right hand open, moving it up, then down, left, then right. Protestant version: generally, Protestants do not perform the Sign of the Cross. Greek Orthodox version: same as above, and using three fingers, but the right shoulder is touched before the left. “Holy God, Holy Strong One, Holy Immortal One, have mercy on us.” The history behind this gesture is fascinating and well worth investigating. Tracing with the thumb: holding the thumb out, a priest may trace a small cross over the Gospels, over the forehead of a child during the sacrament of baptism, or upon the body of a person who is close to death. With a kiss: this variant, popular in some European countries, especially Spain, is made, after making the Sign of the Cross, by placing the thumb across the forefinger and pressing it onto the lips in a sign of devotion. There are other versions, but you get the idea. In the west, people may touch their forehead, shoulders, and heart with the tips of their fingers. This position may signify the open hand of Christ: open to the wounds of sacrifice and open to receive believers into heaven. In other parts of the world, the thumb is placed between two index fingers to form a small cross; the Sign concludes with fingers on lips. If two index fingers are used, they signify the two natures of Christ: fully God and fully man. In my book, The Legend of the Kneeling Nun, the protagonist signs herself using three fingers, so as to signify the Trinity. This book is the reason I researched the topic. When did the Sign of the Cross first appear? How was it done? And why? Although I found answers in different places, I found the New Advent site helpful. “Most of the things we do, we do for no better reason than that our father’s have done them, or our neighbor’s do them . . .” ~ Oliver Wendell Holmes, Jr.
Wouldn’t it be better to know why we do the things we do? At least I think so. … for education, and mixing it all up with a little fun has rejuvenated my spirit, yet I must admit it took almost an entire month! My itinerary began during the waning days of August with a visit to Hatch, NM for the Chile Festival, an annual Labor Day weekend fun fest. While driving with my windows down (chile perfumed air cascades from metal cages that rage red as vendors roast several varieties–I go for the Big Jim’s–a meaty chile often stuffed with fillings like cheese and corn) the road meandered through pecan plantations and past stone churches. I took lots of pictures. We stayed in Las Cruces, NM, ate breakfast every day at The Shed, and tried a new place for dinner, a diner style restaurant called Habanero’s. Their green chile cheeseburgers dripped with melted cheddar as all the peppery goodness sat cozy on a lightly grilled bun. We ordered French fries, which were served inside a paper lined cup, and for dessert, ate the creamiest vanilla ice-cream blended with Mexican cinnamon. A perfect combination, I definitely plan to go back for more! … westward, in High Rolls Mountain Park, NM, we visited friends and sipped their shivery–smooth the rankles off your nerves–apple champagne. They paired it with crunchy crackers, grapes, and cheese, and honestly, it must have been the bubbles that made me feel as though I was floating over their orchard. 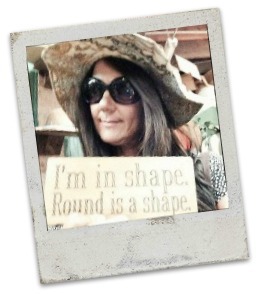 On our way out, we stopped at the Old Apple Barn off of Hwy 82 for a souvenir (I got this fully reversible and totally groovy hat). 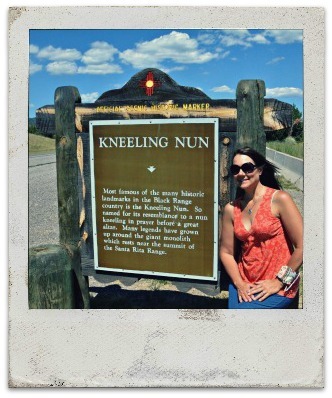 … the next day, we drove to Silver City, NM, home of the Kneeling Nun monolith–and the myriad of tales with which it is associated–a rock outcropping that is the inspiration for my book, The Legend of the Kneeling Nun. Feeling the heat, we stopped at the visitor’s center and spoke with the receptionist. Her suggestion that we visit the Mimbres Pottery display at Western New Mexico University Museum capped our day with wonder, and the contemporary art, inspired by the ancient culture’s artifacts, filled the lower level with fun. When we learned several relics were used by the long-gone peoples to make their version of beer, we were again inspired. After stopping at a convenience store, we went back to the receptionist’s desk, borrowed her shark shaped bottle opener and thought about what we might eat for dinner. Ah, the simple joys! New Mexico is much more than the 47th state to achieve its place in the Union; it is a state of being, and I am blessed every time I’m there. But in September 2014, other places also called my name. … home for a luggage re-pack, I joined friends for an international trip. 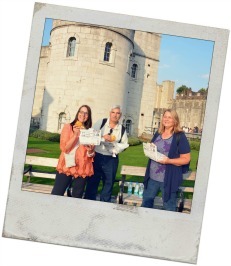 After a quick stop in London for fish and chips on the Thames River, and a viewing of the Crown Jewels, the London Underground, or as it is known locally, the Tube took me back to Heathrow. Full of Fish and Chips! 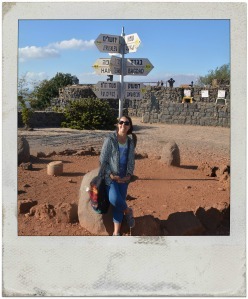 … all the way to Tel-Aviv, we arrived safely in Israel for an amazing tour of the Holy Land. Despite reports of war, our guide noted the peaceful atmosphere everywhere. Indeed, since tourism was down there were no lines to wait in, no crowds to maneuver, and, really, no worries at all. A dip in the Dead Sea, wading in pools beneath waterfalls, strolling through old Jerusalem, visiting ruins both holy and secular … this is why I came. But when I sat atop the Cliffs of Arbel overlooking the Sea of Galilee, my heart quieted. This lonely place … Oh! I have so much to tell you, it’s difficult to hold my thoughts at bay. As September drifted away, I went home only long enough to water my plants for I still had one place left to go. … with family in Ohio. My parents are going through a most difficult time; the severity of illness, the loneliness of separation, grief, hope … emotionally a raw time. Yet our family’s roots seem to be watered with optimism. When we are weak, we know the One who is strong. I learned so much this past month, I look forward to sharing my insights with you. And as before, I will continue to explore the themes that support the time period and peoples of the Old Spanish Missions. In all these things I look forward to sharing more in regard to Linking Yesterday to Today. Spice it up: Chile season heats up Hatch, N.M.
Near my home, in the cool of the morning, you may see a bear eating chokecherries, or a spotted fawn frolicking through the woods. There are mountain lions here, rattlesnakes, foxes and bobcats, and I have come across them all. But of these wild critters, bears are the most troublesome since they love to eat garbage. For this reason (cleaning up moldy apple cores and dirty tissues is really gross) I take my garbage to the dump. Once a week–which is enough. And I never worry about missing the truck. Today I backed my car up to the dump’s transfer bin and went to open my car hatch when something on the ground caught my eye; a doll, face down, prostrate, poor soul–doomed to die before her time. Except …. I brought her home and threw her in the washing machine, and now her sole is clean (not a typo–she had a dirty foot). She is rescued to live another day, so I have named her Amazing Grace. Grace is invaluable to those willing to receive as it offers compassion to the fallen and encouragement to the weak. It is a prayer, an embellishment, a tenderhearted incentive to improve. But whether it is carnal, as in a supposed life style improvement brought on by riches (think conquistadors seeking gold), intellectual (newsflash, the world is not flat, yet somebody had to sail over the horizon to prove it), or spiritual (a meaningful relationship with God takes time, study, reflection, faith), improvement often requires risk, and risk can be scary. Recently, I was in Hatch, NM for the Hatch Chile Festival (a topic tasty enough for its own post). The reason I bring it up is that when I was there, I experienced fear, for I found myself at the pepper tasting table. How hot can a chile be? Hot enough to make you fear its potential to bore through your tongue, erode the enamel on your teeth, and remind you of its fury all over again when it’s time to visit the transfer bin in your bathroom. In the end, having conquered hot chiles (sun rays submersed inside a terrestrial flesh) and experiencing their pleasant lippy burn, one is tempted for good reason to eat them again. For all the gastronomic giddiness I get when eating chiles, I am eternally grateful to the humid soils of South America from whence they came. And in solemn benediction I am reminded that grace invites a grateful heart. * Showing me (did you place her there?) 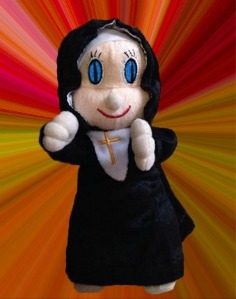 the nun doll today (a day when I learned my father has cancer–mesothelioma) because Amazing Grace reminds me … of what? * When I am overwhelmed, I need all that grace can offer. This one is for you Dad. Because you are amazing.